Search for a method by (partial) name. 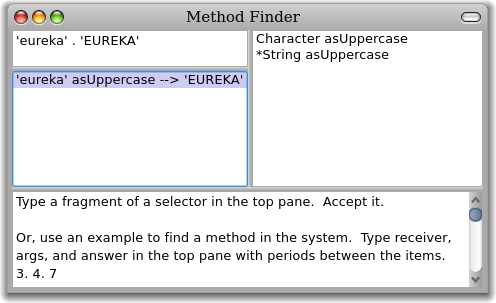 Search for a method by example. By inputting a receiver, arguments (optional) and the expected result, one could find all methods that provide this functionality. Over the years I and various contributors added some more features (like method blacklists, playing nicely with Pry, debugging etc. ), but there was very little active development. A major code cleanup which was long overdue (not quite done, but it was a good start). A new debugging implementation, which is not only more intuitive to use (IMHO of course), but also fixes a bug with hash arguments. Gem version 2.2.1 was released today (I had to yank 2.2.0, don’t ask), and I have several more ideas for future improvements. I’d eventually also like to add some sort of UI, contact me if you are interested in helping out with that!